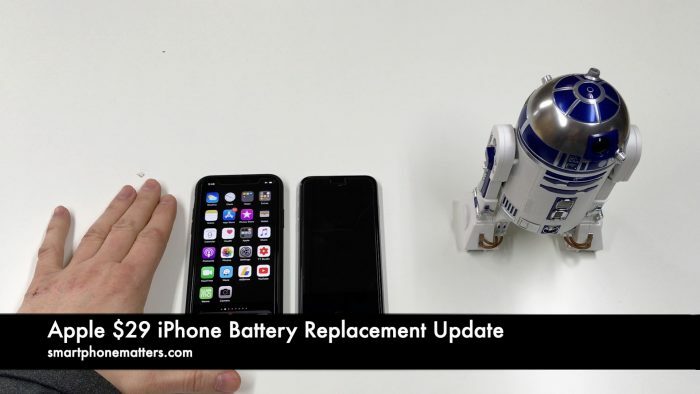 Today I wanted to give an update about my getting my iPhone batteries replaced at the end of December. I took advantage of the Apple’s $29 Battery replacement program that ended on December 31 2018. I talked about this in my last video. This was the program they put in place when it was discovered Apple was slowing down older iPhone models. Apple claimed this was because older iPhones would shut down when the phone would draw more power than the older, weaker batteries could deliver. The media and internet claimed they purposely slowed older phones to get you to want to update to a new one. Regardless of why they did that, it was pretty bad that they chose not to tell customers that this was happening. Anyway I told you that I planned to get two new batteries, one for my iPhone 6s which is a few years old and another for my iPhone X. the iPhone 6s was old enough that a fresh battery for $29 would be a good deal. My iPhone X is only a year old, but in 2019 an iPhone X battery update would cost $80 so I figured I’d get a fresh battery now. I made an appointment at the Apple store for before Christmas, back when I picked up that iPad Pro I did the unboxing video for. I had to cancel the appointments because my schedule changed and I couldn’t wait around the store. So I went in before the end of the year. The Apple store was packed with people getting battery replacements. Many people couldn’t get a new battery because they were out of stock. They still got the $29 battery ordered for them and could come back within 15 days of when the battery was in stock in the store. For my iPhone X, they only had two batteries when I came in. They reserved one for me. When it is time for your appointment, the store rep brings out the battery for your phone and then takes them back to the technician to change the battery. They give you an estimated wait time. When it was time for the appointment, they couldn’t find my battery! I waited maybe 15 minutes while they looked for it. They ordered a new battery for me and I’d have to come back. I was about 30 seconds away from leaving the store and they found the battery. So I waited about an hour in the mall, and they replaced my battery. My iPhone X is now back to full capacity. They said me battery was at 95%. It seemed to me like battery life was shorter, but I started using my phone way more after I gave up my iPad so, who knows. I ended up not getting the battery changed in the iPhone 6s. I decided not to keep the phone. More on that later! One really annoying thing I realized is that my Sprint SIM won’t work in another phone! I tried to use the SIM in my iPhone 6s while I was waiting for my iPhone X battery replacement. The SIM just showed No Service, I asked the service rep if that was because the MEID wasn’t registered. He thought so. So my iPhone X was a new battery. If I hand it down to Mrs. Thompson, she’ll have a fresh battery. I’m not planning on that but now that she has Face ID on her iPad Pro masybe she will want to upgrade.